You tried, America. You tried. Despite overwhelming bipartisan support for safeguarding the open internet, the Federal Communications Commission voted on Thursday to ignore the public and kill net neutrality protections. The vote was briefly delayed after Pai’s comments were interrupted by security. The room was evacuated and searched by Federal Protective Service before Pai resumed. The nature of the threat was not immediately disclosed. Why such a bipartisan outcry? Because the large majority of Americans are in favor of keeping strong net neutrality rules in place. But the saddest part, to me, about all of this, and it’s painful for me to say this, is that this is the new norm at the FCC. A norm where the majority ignores the will of the people. A norm where the majority stands idly by while the people they are committed to serve, that they’ve taken an oath to serve, are about to lose so much. In August, a study funded by the broadband industry found that 98.5 percent of unique comments submitted to the FCC regarding net neutrality were opposed to gutting the rules that went into effect in 2015. We have to specify unique comments because the FCC was overwhelmed by 23 million comment submissions, and many that supported killing net neutrality were filed by fraudulent bots robo-signing forms and stealing real people’s identities, according to New York Attorney General Eric Schneiderman’s office. Even though the FCC is required to consider public comments for a specified time period, it has refused to cooperate with Schneiderman’s criminal investigation into the corruption of its commenting process. FCC Commissioner Jessica Rosenworcel, one of the two Democratic commissioners who voted to keep net neutrality rules in place, explicitly said this week, “there is evidence in the FCC’s files that fraud has occurred,” but the agency won’t cooperate. 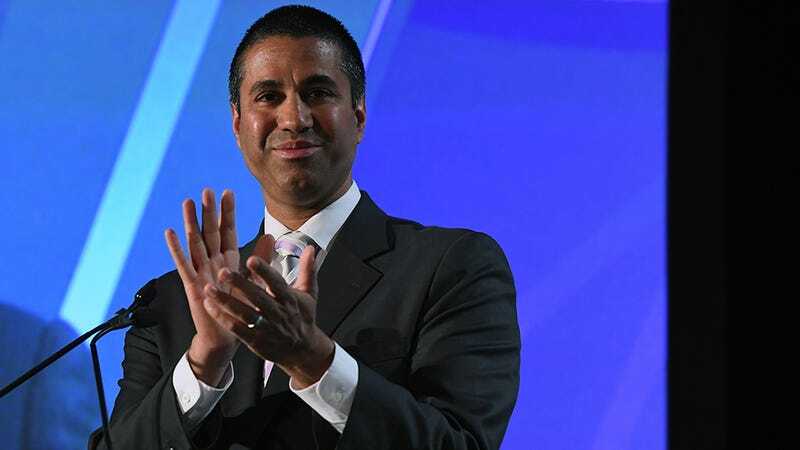 Regardless of the process, or the criminal investigation, or the protests, or the opposition from lawmakers—including fellow Republicans—Pai and his cronies were always going to ignore the public. The chairman has made his disdain for the public’s input and any study that disagrees with his position absolutely clear. He will go down as one of the Trump administration’s most effective pro-corporate puppets. And when he leaves office, he’ll be welcomed by the telecoms with open arms. But that doesn’t mean all is lost. Even though ISPs have been softening their statements that promise never to violate net neutrality principles, they must wait to take full advantage of their newfound freedom. There’s too much public scrutiny at the moment for them to start installing fast lanes or censoring content. Lawsuits challenging the decision will head to court from every direction. And with the right push from voters, Congress could even do the right thing by passing a law to correct this injustice.